Komplete 9 will feature 33 virtual instruments (vs 27 in version 8) and a 120GB sound library (110GB in v8). Komplete 9 Ultimate updates the number of available virtual instruments to 65 and the sound library to 350GB. This version will ship on a hard drive. Both bundles will include two new products, as teased in the recent videos posted by Native Instruments: the Monark virtual synth and Battery 4. Kontakt will remain in version 5, and so will Reaktor. 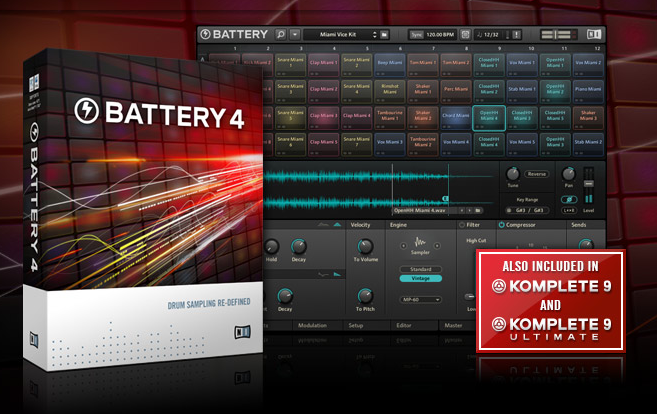 Battery 4 will bring a new GUI with direct access to the main features from the main window, an enhanced drag and drop system for assigning MIDI controllers, routing, changing the order of effects, controlling the sidechain... Cells are now available with a color code for each type of instrument, and a new multifunction wave displays has been added. 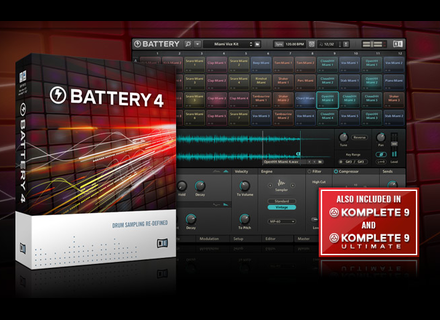 Battery 4 will include new effect processors (Solid EQ, Solid Bus Comp, Transient Master, tape saturator, compressor, new filters), improved Time Machine Pro time stretch algorithm, a new bus system and a new browser with tags and history. MIDI note mapping for each sound is also included for using Battery 4 with keyboard controllers. Komplete 9 Ultimate will retail for $1099 / 999€ (updates from 399€/$), the suggested price for Komplete 9 is $559 / 449€ (updates from 149€/$). They will both include e 25€/$ voucher valid towards any Komplete Instrument/effect or Maschine Expansion at the NI Online Shop. Native Instruments is also offering nine lucky winners the Komplete 9 Ultimate bundle before its release on Twitter. Friday's Freeware: LoopJam Remix lovers will have a heyday with LoopJam, a loop slicer developed by Codemusicians and available in open source. Lachnit launches the FLK MK2 keyboards Lachnit, an austrian keyboard manufacturer, has launched the second version of its FLK 88 and 97-key USB MIDI controllers.